Full disclosure: this post was inspired by Sharyn waking up saying that she spent the night dreaming about correcting the punctuation in protest signs…! We have all seen pictures on the internet of protesters holding signs and the bad spelling and punctuation makes them look, frankly, dumb. We have also seen signs for a business on the internet that have bad punctuation and misspelled words. When we see them, what do we automatically think of the person who is holding that sign? Or that business? Yes, we think they are not all that intelligent. And we think less of them. If a prospect is deciding on giving you a check, would you rather she think you are intelligent, or not very smart? Of course, we all just chose intelligent. So, why let a simple mistake hurt your opportunity to increase your sales? Most of the time, the mistakes on signs are because someone rushed to finish them, or proofing them. It is easy for me to show you bad signs to get my point across in this blog, but what about mistakes in your presentations? Or emails? How do you think they make us look? This blog is a reminder to take a few minutes to do what our elementary school through high school teachers told us to do: Check your spelling and punctuation before turning it in. It is sad how many people don’t do this and by remembering this blog, you will add a few percentage points to your closing rate because your work will stand out from competitors who were too busy to pay attention. This is a small, incremental change you are making, but it makes all the difference in the world. Let’s talk about resumes, for a moment. When I was a sales manager for a national company, I saw resumes every week from people who wished to work for me. I knew I was not going to interview all of them. I only wanted to chat with the ones who met my standards. My first time through a stack of resumes was the “easy elimination round.” That was where I took out all the ones with mistakes: spelling, grammar and just bad writing style. Why? At that time, working for a promotional product company, misspelled words cost us money. If they blew it on their resume or cover letter, their primary marketing piece to get hired, I could not take the chance on them. Now imagine that is one of our cover letters or emails with a proposal to do business with us. Can you blame the prospect for not returning your call? Why should they call us when we threw up a huge stop sign by using bad spelling, grammar, or punctuation? To help you get over some easy hurdles, here are many punctuation rules to help you out. 1. We use them at the end of a declarative or imperative sentence. Our appointment lasted an hour. Bring back the rental car on time. 2. Use a period after initials, abbreviations, and contracted words. 3. Use only one period to complete a sentence which ends in an abbreviation. 4. Use a period, rather than a question mark, after an indirect question. He asked when we would be leaving. Use a comma to separate words and phrases and in a series, i.e. Jennifer was not altogether happy, it appeared. 1. Use a semicolon ( ; ) to separate independent coordinate clauses closely connected in meaning when no coordinate conjunction (such as and, but, for, or, nor, or while) is used. Everyone’s business did better after investing in The Small Business Marketing Plan; the average sales went up 47%. 2. Use a semicolon before a transitional word or phrase which joins the coordinate clauses of a compound sentence. Jennifer was not excited about going to the baseball game; besides, the tickets were very expensive. 3. Use a semicolon in lists where a comma is insufficient to separate the items clearly. Jennifer was deciding which features of The Small Business Marketing Plan she liked the most. She is choosing from the coaching feature; the fact that her non-profit gets a free copy; and that she gets to attend the live marketing bootcamps for free. 1. Use a colon ( : ) before a list of items or details. Jennifer bought The Small Business Marketing Plan because she needed help with three things: locking in her target market, closing sales, and using social media effectively. 2. Use a colon after the salutation of a business letter. 1. Use a question mark after each separate part of a sentence containing more than one question. Should Jennifer give her free copy of The Small Business Marketing plan to the Boys and Girls club? The Chamber of Commerce? YesICan.org? 2. Use a question mark at the end of a question. What time yesterday did Jennifer buy The Small Business Marketing Plan? 1. Use an exclamation point to express a strong feeling. You do not need more than one. Jennifer is so excited that she bought The Small Business Marketing Plan! Use double quotation marks ( “ ) around a direct quotation. Do not use them for indirect statements. 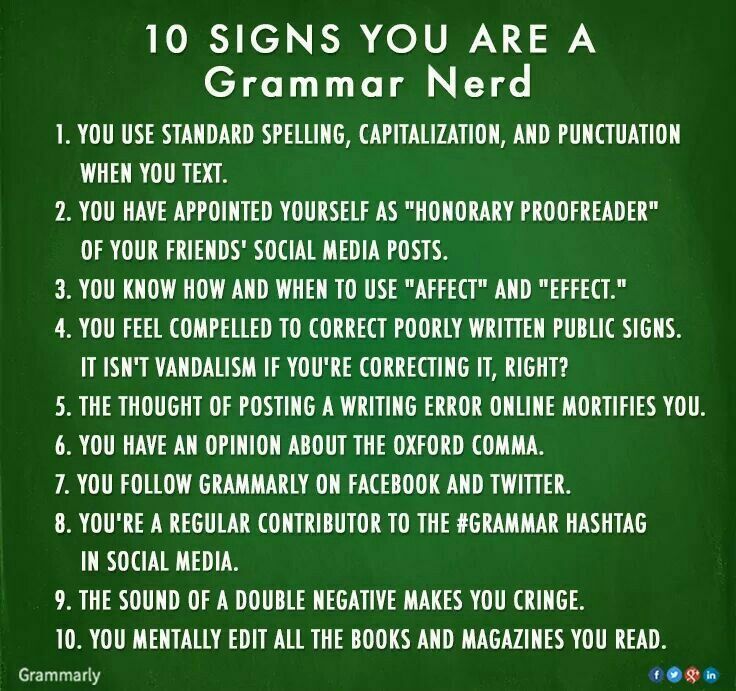 10 signs you are a grammar nerd.